I have to confess a personal interest in this book. I first saw the manuscript in March 1997, when David Burnett brought it with him to a week on the Tweed. While we waited for the river to drop enough for us to drive down the road, we read, drank scotch, talked fish, and dug worms. 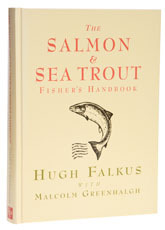 The work is a lucky dip of bits and bobs distilled from Falkus’ earlier works, seasoned with tremendous amounts of good advice from Macolm Greenhalgh, among whose contributions is a fascinating chapter on fishing for sea-trout in salt water. The Handbook is a sensible and solid guide to every aspect of fishing for salmon and sea-trout. In my opinion the book makes a first class introduction to the sport for beginners, and it isn’t without interest for the more accomplished fisherman. The final chapters are packed with goodies. The essay “Sea Trout, Darkness and the Sunk Lure,” written by Falkus in 1966, appeared nine years later in amended form as the first chapter of the 1975 second edition of Sea Trout Fishing. Chapter fifteen, “Tom Rawlings on the Falkus Method,” is another jewel. The early part of this chapter first appeared in Trout and Salmon in 1970, six years after Falkus’ Sea Trout Fishing was published. The first edition of Sea Trout had sold very slowly, but the appearance of Rawling’s articles catapulted Falkus into the limelight and the 1971 reprint was a runaway best seller. When Rawlings wrote the article which appears here as “Fish all Night for Big Fish,” the majority of sea-trout fishermen had never heard of Falkus, fished floating lines, and packed up and went home at midnight. The Rawlings articles, by drawing attention to the Falkus method, started a revolution in sea-trout fishing. Hugh Falkus died in March 1996, and fishing (though not the world of personal relationships) is the poorer for it. Most of this book is therefore Malcolm's work and the fact that Hugh managed to get any writing done on this book at all is a tribute to his irascible strength of character in the face of a losing battle against an incurable disease. His contributions show the real flair he had not only for fishing but for writing. When you read the book, raise a glass to him. We shall not see his like again. This book has become seriously collectible and now fetches up to six times its original price.